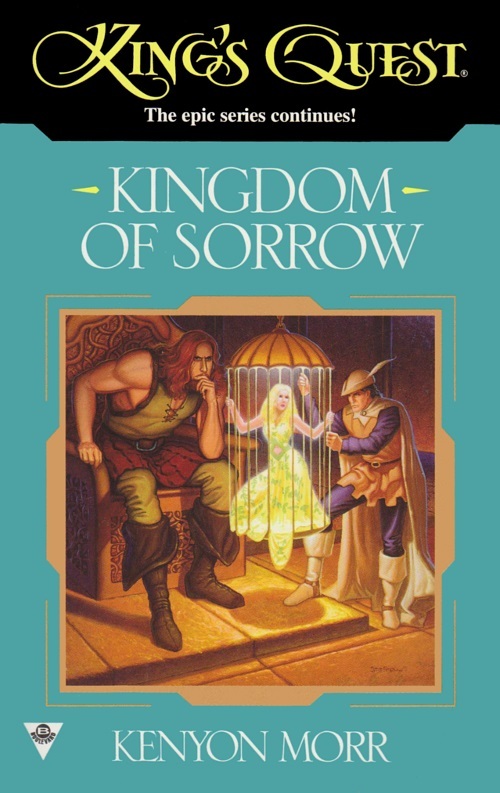 Based on Roberta's Williams King's Quest series, King's Quest: Kingdom of Sorrow is the second volume out of three King's Quest novels. Sierra had little to do with the books other than licensing another company the permission to write them. This novel was written by Kenyon Morr (pseudonym of Mark Sumner and Marella Sands). This novel takes place before the events in the first novel. Rosella is seven years old and the kingdom is still in good shape. The beginning of the book gives enough backstory for the non-gamer to understand the gist of life at Castle Daventry. In spring, Daventry suddenly finds itself trapped in unnatural cold weather and snow, a second winter, a curse of endless winter. Graham and Valanice are invited to the Old Wood of the fairies where they learn that Ahi'aorina, the Queen of the Old Wood - the very essence of Spring itself - has been kidnapped by the giant Dunstan. It is up to Graham to track down the kidnapped queen and set things to right. He meets a variety of different characters with a variety of good and mediocre characterizations on his journey. Graham is accompanied by a wandering minstrel.